Momma Told Me: There's no such thing as too prepared. At 4:31 AM on January 17, 1994, a seven year old me was awoken from her slumber by a very intense and disorientating rumble that lasted exactly 16 seconds. A blip on the map of my life, but the original Northridge Earthquake and the aftershocks that followed were forever ingrained in the back of my mind. The 6.7 earthquake would soon go down in history as one of the fastest accelerating tremors in an urban area, and just 18 miles from the quake's epicenter, our little condominium community was more than shook up. Clutching Momma's nightgown, and my favorite stuffed porpoise, I wandered outside. Our neighbors were in various states of panic, many without proper footwear, or even a flashlight; but my father had his emergency preparedness kit on hand. As we waited out future aftershocks and structural clearance through that morning several of the elements inside proved invaluable for comfort and peace of mind. Living in Southern California our biggest natural disaster concerns are wildfires, earthquakes, and flash floods/tsunamis (living near the beach we are in a marked tsunami evacuation zone.) Unfortunately Hollywood would have us in the mindset that a Zombie outbreak is more imminent than a REAL natural disaster. Us Southern Californians are pretty laid back and, as nice as that is to live here, that kind of mentality could lead to being unprepared during a real natural disaster. It doesn't matter how nice the climate is where you live, every family must be prepared for a variety of natural and unexpected disasters. As I type this it is 85F outside, at the beginning of February- the sun is shining, and I am just a 10 minute walk from the beach. It's hard to get into the mindset of natural disaster preparedness when the climate is so ideal and the terrain so mild. But is is crucial. As the Santa Ana winds kick up here in the Los Angeles area it truly is important that local residents take note of their emergency plans and also consider other natural disasters natives may encounter. We must ask ourselves; Am I prepared if a wayward brush-fire cinder lands on the roof after lights out? Do my kids know how to exit the house from the second floor? What would I do if a power grid outage meant lights out for days? 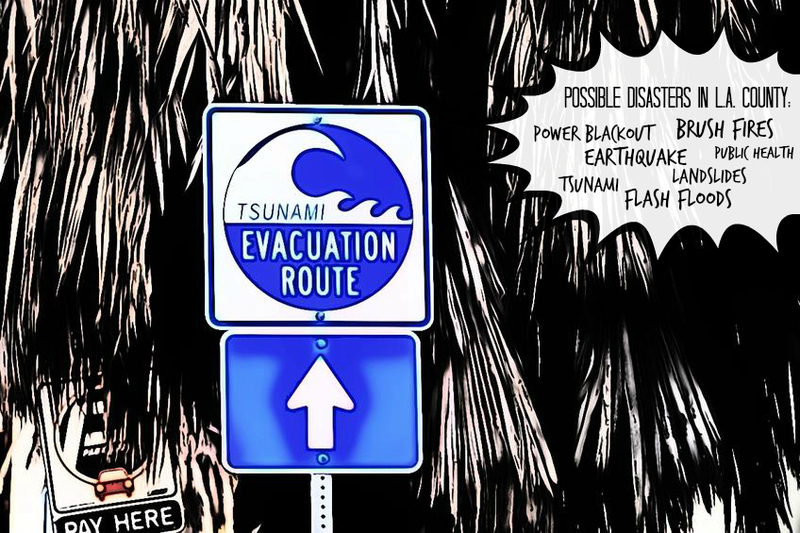 What's the safest evacuation route in case of a tsunami? There are many details to consider when preparing for emergencies in Southern California; communication should always be your biggest tool. 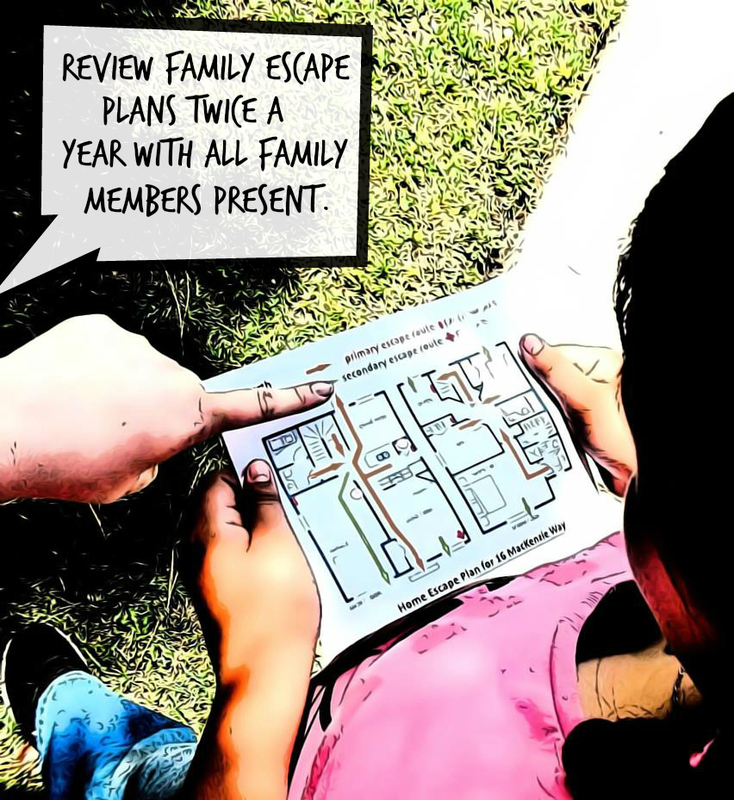 Go over your family's evacuation plan and outline any first aid kits or fire extinguishers on a map of your house. Be sure to go over the escape route a minimum of twice a year, and verify that marked exit routes are unobstructed and prepared. Piecing together an emergency kit can seem overwhelming, but having one is necessary in any size home. 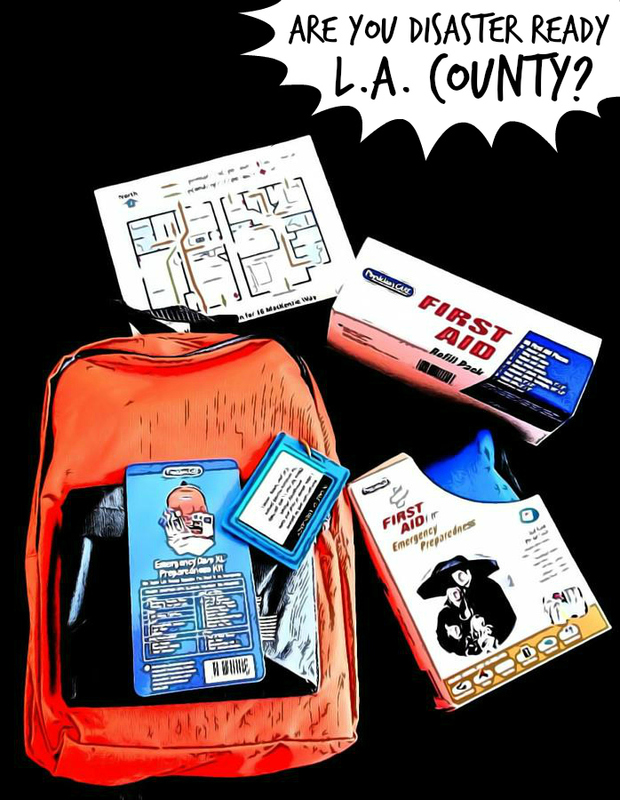 Two story homes should have a minimum of two fully stocked emergency kits containing everything from survival essentials to first aid staples. You can buy pre-made emergency kits from your local hardware or big box store. 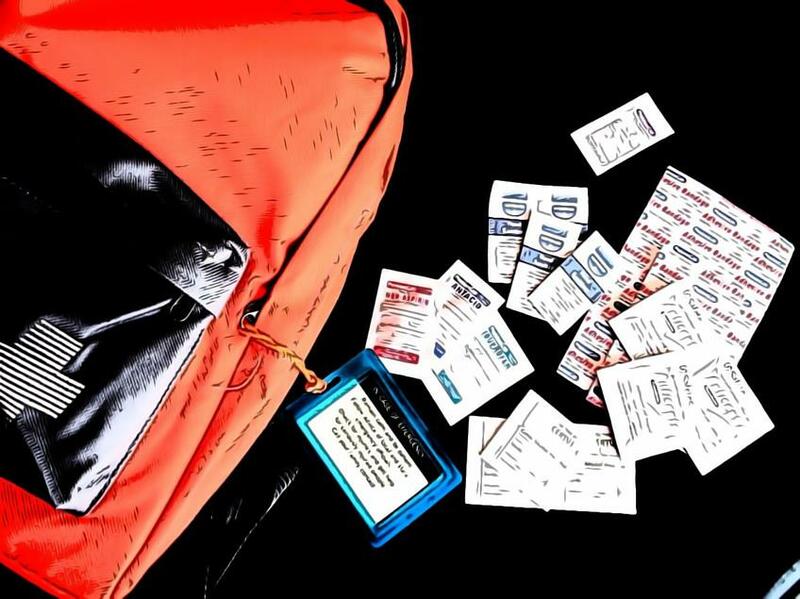 All of the necessities inside are often bundled in an easy to see orange backpack with or red carrier with a reflective ID and emergency contact tag. I highly encourage LA County residents to store their emergency kits in a hard shelled container, such as a bucket, which will keep supplies clean and undamaged in the case of property damage or debris. You will likely also want to ad some of your own essentials (batteries and power banks, candles, a crank radio, personal hygiene items, activities for the kids) or even a refill kit of first aid supplies. Having all of your emergency supplies in an easy to grab, and spot is essential come the panic of an unforeseen natural disaster or emergency. 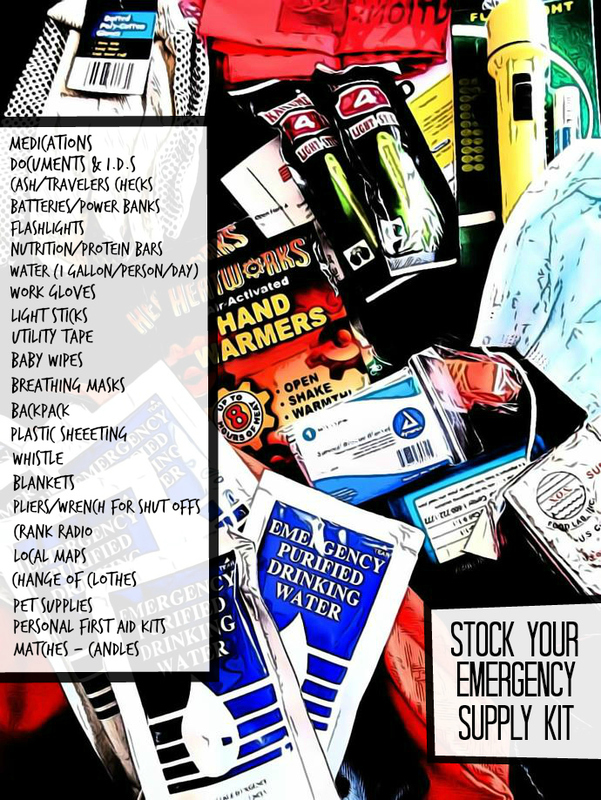 For more tips on what to stock your emergency kit with refer to this Emergency Kit worksheet. Part of being prepared is following up on your safety kits and plans yearly to ensure all supplies and documents meet current needs. In the case that some of your supplies expire you can always pick up a refill kit from the kit's manufacturer or supplement with your own supplies. Choose a central location near multiple exits in your home to store your main emergency kit, and be sure to pick up a few smaller, basic first aid kits to have in alternate locations around your home should you or a family member be cut off from the primary one's location. When considering natural disasters it's also important to stock up your vehicle with a condensed version of your emergency kit, in addition to flares, emergency blankets, and water.Especially here in Southern California, natural disasters may strike without warning at any location. Should you find yourself on the road when one does you should not rely solely on modern technology to get you by. 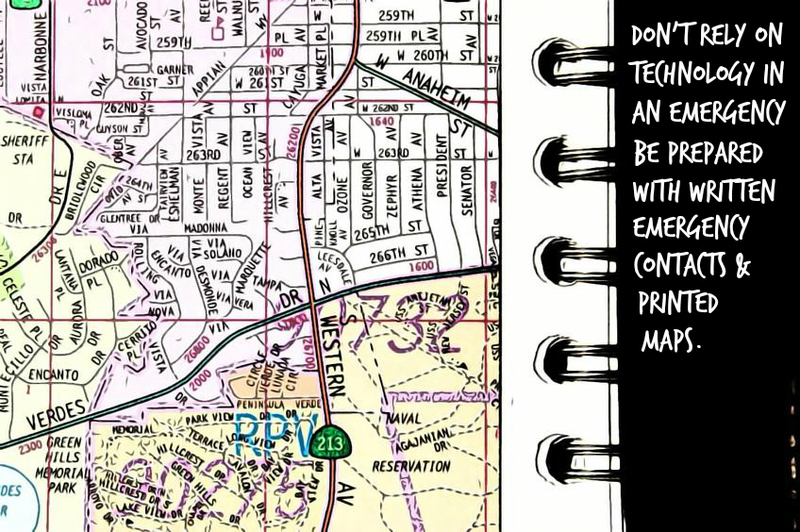 While power banks could help, smartphones may be compromised and cell service may even be shut off- Always keep a current map book or road guide on hand. In the event you are caught on foot, or need to divert your route, in an emergency knowing the terrain for alternate routes, as well as local emergency meeting points (schools, government buildings, etc) can prove life saving. As a pet mother I'd be remiss if I didn't wrap up this reminder with a note to prepare for furry family members too. Most emergency shelters do not accept pets for sanitary reasons, be sure to locate and identify safe places to bring pets in advance of a disaster. 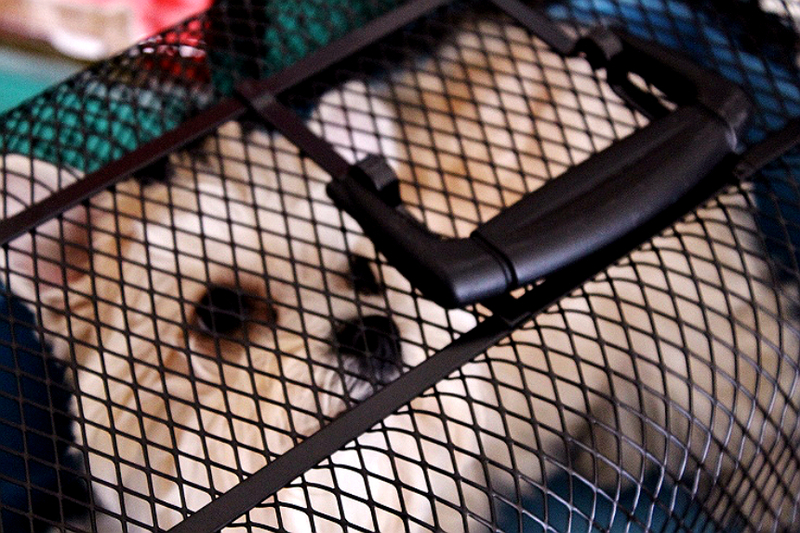 Often veterinary offices and animal shelters will open during an emergency to house pets. 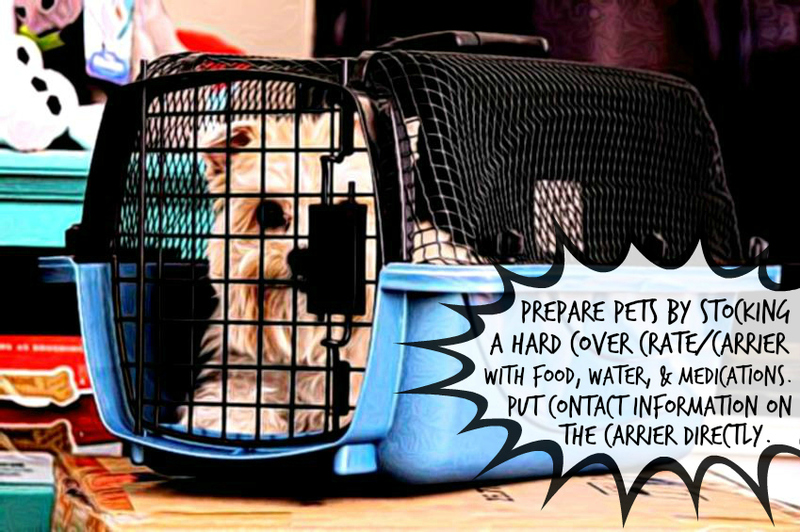 Be sure to have backup food and water for them, because supplies may be limited at such temporary shelters, and ensure all crates and kennels are well marked and identified with hard shell frames or exteriors. You can never be truly prepared for an unexpected natural disaster, but the difference between no preparation and some could be a life. For Los Angeles locals the ReadyLA online emergency resource hub has a wealth of free natural disaster preparedness resources, please stop by and learn more today. Sign up for local L.A. County emergency and disaster updates via text at www.nofiyla.org. You may also text NOTIFYLA to 888-777 (one word) for updates if you don't wish to to sign up through the website. 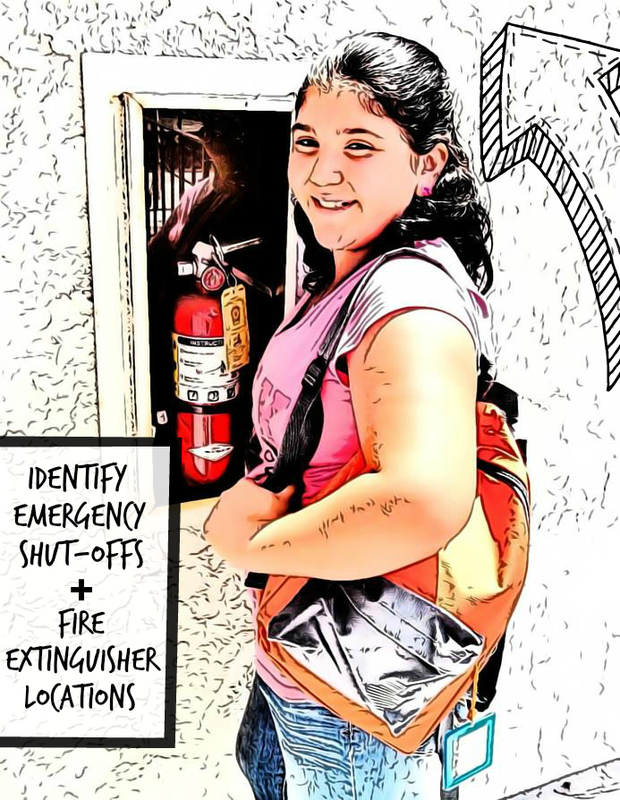 What Daughter Says: Awareness is the first step to preparedness. We have tornadoes here year around. It's crazy. I totally agree with being prepared. We always try to have a lot of bottled water and our first aid kit! My son just moved to California so I will need to remind him he needs to make sure he has his Florida emergency kit updated and ready in case he needs it for his new area. 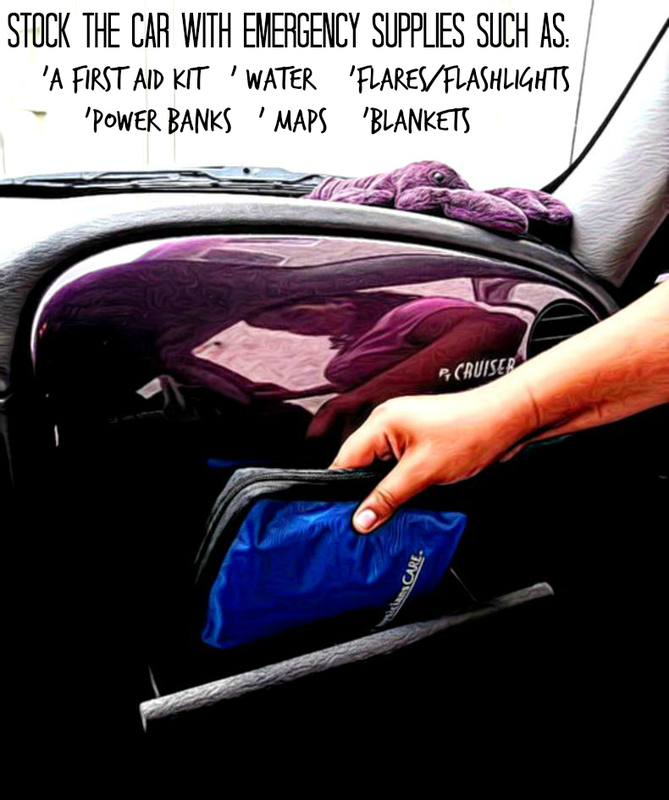 We keep our emergency kit in the same place and ready if we need it and also as you suggested in your post, we have our car stocked as well. My husband and I also have a plan for meeting in case one or both of us are out of the house and can not get to our home. I think this is important information no matter where one lives. It's always good to have an emergency preparedness kit on hand. We had an earthquake in MI once which was interesting, it was very mild but I could see the bookcase in my parents' office shaking. I told them about it and they thought I was crazy but the next day it was in the newspaper. I have no experience with earthquakes but your plan and advice is spot on for disaster preparedness. So many people have a "it won't happen to me" attitude and fail to plan for these emergencies. This article is so shockingly true. LA disasters, well disasters anywhere, need to be planned for. I must admit that I don't have anything just grabable that I could walk out the door with. I love this line: Awareness is the first step to preparedness. Your article could really be a pamphlet for preparedness in LA, with so many chances for disaster. PS. How do you make those cartoon pictures? So cool. It really is so important to be prepared! Love the idea of making these plans as a family - my mom used to do that with us growing up. I think wherever you are you should be prepared for a disaster. Where I live we really don't have a huge amount of any any kind of weather or earthquake a disaster stuff but there are certain things that I do get here too and I think that you need to keep something on you at all times for that. we are nowhere near prepared enough for emergencies and it is something I keep meaning to address. Disasters can happen anywhere and being prepared can make a huge difference. My husband, a Southern California boy, vividly remembers Northridge and shared stories of watching the sidewalk buckle. Being prepared is extremely important no matter where you live! Great post! I like that you have an evacuation route in your emergency pack. Very smart, and I'm going to start creating mine this weekend because of you! Thanks! It is so important to be prepared for an emergency. I am in the process of updating my emergency kit. These are great tips for being prepared in case of an emergency. I will have to make up an escape route for my family and practice a few drills. I think it's always important to be prepared. Anything could happen. It's so important to be prepared for emergencies! You don't want to be caught in a bad situation! It is so important to be prepared, I will admit I may not be fully prepared but I am almost fully prepared. Your post gave me some ideas on how I can exceed how I am semi-prepared! Oh man, you all can get a lot of natural disasters there! We can get hurricanes here and bad blizzards so I guess it is a trade! I feel like you can never be prepared enough so having a plan like this is crucial! We keep water and flashlights in our closet as well as an insurance binder for when disasters come. It's sad to think about but so practical - especially when you live in tornado alley.